Originally a self-published work, in 2015, the rights to Wicked Game were acquired by London based publishers Orenda Books. Matt is an ex-soldier and cop from the UK.Matt Johnson is the author of the 2016 John Creasey CWA Dagger listed novel ‘Wicked Game’ which was listed by Amazon UK as the highest-rated rising star novel of 2016. I’ve had Wicked Game on my Kindle since it came out, and with the news that book two is on its way, I figured now would be a good time to get this one read. It’s been so long since I looked it at that I didn’t remember the blurb which always stands in my favour as I know I have no expectations. However, this is an Orenda Books author, so I knew I was in for a treat and I wasn’t let down! Wicked Game is a debut, and a very assured one at that. Following Robert Finlay as he leaves Royalty Protection to move to an Inspector position in a police station, this book is surprisingly fast paced. Police officers are getting murdered, and Finlay starts to make the connection between his previous classified SAS days. What follows is a highly intriguing cat and mouse chase that doesn’t let up until the very end! I won’t go into plot details, as usual, but what I will say is that Matt Johnson has written a very cleverly plotted novel. 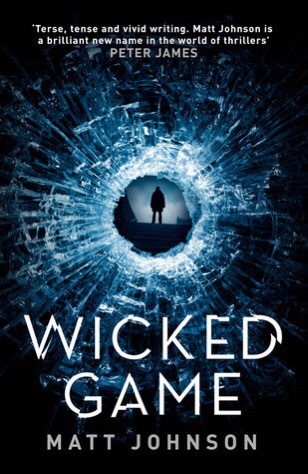 Full of twists and turns, with some excellent characterisation and a really great descriptive narrative, Wicked Game is without doubt a superb debut.